Implanting a powerful microprocessor in the human body-to assist the blind and deaf and to monitor and stimulate damaged hearts-is just one of chip designer Bill Mensch's current projects. The idea may sound farfetched, but Mensch's credentials are impeccable. He singlehandedly designed the 16-bit 65816 microprocessor that Apple Computer chose as the central processing unit (CPU) for its new Apple IIGS. He's also the father of the Apple IIc's 65C02 processor, and was instrumental in the development of the original 6502 chip. As founder and director of his own company, Western Design Center, the ingenious and independent Mensch is making a name for himself as the wizard of microprocessors. Compute! recently spoke to him about the 65816 chip, the history of the 6502. family, and the future of computers. The brains behind a computer is its microprocessor. And the brains behind the brains is 41-year-old Bill Mensch. Mensch's designs over the years have probably done as much as anything else to aid the proliferation of microcomputers. He was a member of the design team-at MOS Technology-that developed the 6502 microprocessor which is used in one form or another in Apple, Atari, and Commodore 8-bit computers. He designed the 65C02 that the Apple IIc uses, and most recently the 65816 that brings the Apple II family into the 16-bit computer world. In many ways, Mensch's story is a fascinating history of one man's long-range vision-for himself and for his creations. Born and raised in the farm country of Bucks County, Pennsylvania, Mensch graduated from high school knowing plenty about hard work and farming-and nothing about electronics. He enrolled at Temple University and studied to become a technician, since the university then had no engineering program. (In 1984, Mensch was invited back to be the Engineering Department's Alumnus of the Year.) Mensch jumped on the fast track right after college, joining Philco in its pioneering work on MOS (Metal-Oxide Semiconductor) technology-the manufacturing process behind all microprocessors today. He later picked up an engineering degree at the University of Arizona and moved to Motorola, a leader in microprocessor research. 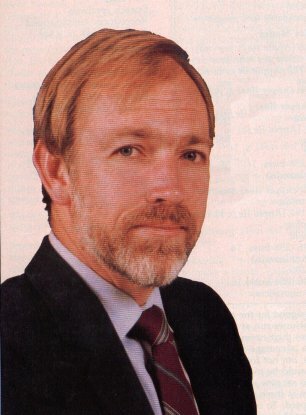 There, he was on the design team that created the 6800 chip, the eight-bit predecessor to the 68000 microprocessor used in the Macintosh, Atari ST, and Amiga computers. He was also one of the design team members at MOS Technology when the company created the 6502 microprocessor. A little more than eight years ago, Mensch started his own microprocessor design company, the Western Design Center in Mesa, Arizona. Since then, he's been involved in chip design for applications ranging from personal computers to advanced medical research. The microprocessor world is a universe of microns, each of which represents the millionth part of a meter. Mensch is designing the equivalent of a small city-with miniature streets, bridges, buildings, and junctions-all of which must fit on a piece of silicon just a few microns thick and no wider than a small fingernail. This silicon wafer actually contains an intricate grid of microscopic transistorized circuits. And squeezed within this world must be the intelligence to let the unit gather instructions from memory chips, execute those instructions, and store the resulting information back in memory. Mensch is now doing for integrated circuit (IC) technology what he says Apple Computer has done for the microcomputer-making it less expensive and available for widespread personal use. Astonishingly, at a time when microprocessors are increasingly being designed on sophisticated electronic workstations by teams of engineers, Bill Mensch works alone on sheets of Mylar drawing paper. He is now completing the design of a local area network on a chip, to be implanted in the human body. It will monitor and react to a wide range of physiological stimuli which affect functions ranging from those of the heart and muscles to hearing and even eyesight. Many of us make indirect contact with Mensch every time we sit down at our Apple II, eight-bit Atari, or Commodore computer. At a time when much of the personal computer microprocessor publicity is directed at big names such as Intel (designers of the IBM PC microprocessors), and Motorola, Mensch is quietly providing Apple Computer with ways that it can make good on its slogan, "Apple II Forever.". COMPUTE! : How has the design process changed from when you first worked on the 6502 to the development of the 65816-is it a team effort, or is it primarily one or two people? Well, as it turns out, on the 6502 we had several people involved in the design and the definition of the product. GTE was involved with it. Apple was not involved with it. On the 65816, I did the design of it. I had an associate company do some of the logic design on the 65C02. But on the 65816, I wanted to-you know, it's the old thing, I wanted to do it my way. I decided that I wanted to do something that would be kind of a special treat for myself and my sister-my sister Kathryn is my layout design manager. And so my sister laid out the entire 65816, and I designed the entire 816-did all the logic design and wrote the data sheets. I did all the test developments. I did everything that the engineer does on the program. So the 816 is, I believe, the only 16-bit microprocessor that has ever been designed by one engineer and laid out by one layout designer. And who also happen to be brother and sister. Yeah, brother and sister on top of it. It ends up being a very special thing that we share. How does the 65816 microprocessor relate to the earlier 6502 chip? The history of the 6500 series microprocessor starts with the 6502 that was NMOS [one of several versions of MOS] technology. We developed the 65C02 here at Western Design Center, and when we developed the 65C02 we also had the 65816 in mind. When did you start work on the 65C02? Those new opcodes are meant to enhance its capabilities in the controls marketplace and also for some of the high-level language applications. Such as, in an Apple-the Pascal, [the BASIC] interpreter, things like this-run about 20 percent faster because of the new opcodes. If you look at the old 6502 opcode matrix, you'll find that there are large areas of the opcode matrix available for improvement. Our goal on the original NMOS 6502 was for controls application. The personal computer didn't exist at the time, and therefore our focus was to deliver a product, a microprocessor, that could compete with the 4040 [an early microprocessor from Intel]. We didn't want to add in a lot of instructions that would increase the die size [the silicon chip size] because the cost of the chips is directly related to the size of the die. So, we had a lot of discipline-while other competitors of the 6502 didn't show that discipline. The 6800 [a chip from Motorola]-you look at the opcode matrix and it's very well populated with instructions. It became almost impossible to put in an easy upgrade system in the 6800 system, and that's why you see Motorola went to a totally new architecture with the 68000. Now, the [Intel] 8080 did the same thing, in that if you look at that opcode matrix you see that there's no migration path to 16 bits without having to [alter] the entire architecture. The [Zilog] Z80 represents the same problem. The Z80 is set up and uses most of the opcodes, and therefore extensions become 16-bit opcodes; 16-bit opcodes slow the machine down. The 65816 only has 8-bit opcodes. So that means that in each instruction we take less memory because we stay with a single-byte opcode for the 65C02 and also, of course, for the 65816. Which means that the 6502 was quite an expandable chip, relative to the others? That's right. It was planned originally to have upgrade paths back in 1975 when we developed the product. So, here we are in 1986, and I'm just finishing up a couple more chapters in the original concept, or plan. And how does that affect the average Apple computer user? The end user, the guy who buys an Apple II or other products that use the 6502, what they get is the ability to upgrade their system without giving up their software. And when you have a plug-compatible part, it also means that you don't have to give up your hardware. So, the overall goal of your efforts...? Our game plan is to upgrade the Apple IIe to a 16-bit capability, and then have the total technology capability to reduce the number of chips in the system or improve the performance of the system, or a combination of both, so that the user ends up with more value for the dollar. And with no loss of compatibility. Right-total compatibility. We always have to stay with the compatibility. If someone wanted to purchase a 65816 directly from you, what would be the cost? Our price is $95.00 in single quantity. We realized there would be people interested in having single-piece quantities (for the people that have personal computers out there), so we set up a price that is not totally inconsiderate of the user. COMPUTE! : You've touched on this, but what would you say the chief problem is in developing a compatible chip as you have with the 65C02 and now the 65816? The chief problem is, if you start off with the wrong processor, you're always going to be fighting the system. In other words, if it wasn't for the 6502 original concept, I would have been having a disaster of a time trying to do it. So, one of the most significant problems in doing such a thing is: Are you starting from the proper base? And in the case of the 6502, we left all the doors open to do what I am doing. And that's the reason why you don't see the same upgrade capabilities with the eight-bit processors at Intel and Motorola. How difficult is it to achieve compatibility in a microprocessor? The chief problem that exists in maintaining the compatibility going from the 65C02 to the 65816 was forcing the discipline of total compatibility-meaning the same number of cycles in the instruction, the same construction of the instruction, the same architecture of the instruction. That meant that I had to add some logic in there for emulation. And when we talk about emulation, we have to be able to do interrupts the same way; we have to be able to handle the data going onto the stack and returning from the stack. You've got to protect the user from disasters which could occur because somebody in their application modified memory. When they did a return from interrupt, they could've changed the status registers and things like this. So, those kinds of areas are very detail-oriented. In the case of an Apple computer, as an example, the way that [Apple co-founder Steve] Wozniak did his disk controller, we had to make modifications because of the way that the disk controller works. The compatibility has to do with some of the details of the cycle timing and other things like that, that's the most important. The clock speed of the 65816-is it about 4 megahertz? Yes. Our typical product is 4-megahertz. We sell 2-megahertz into the retrofit market, but our typical run-of-the-mill is 4-megahertz. And that's at the 3-micron level. At 2.4 microns, which we're developing right now, our typical part looks like it's around 6-megahertz. [By comparison, the clock speed of the 6502 is between 1 and 2 megahertz, depending on the computer you use.] at a typical 8- to 12-megahertz. At what point do you run into problems with increasing the speed? We see right now a standard off-the-shelf RAM of 6-8 megahertz as the upward limit because of the memory technology. Now, the reader should be familiar with what we're talking about-6 to 8 megahertz-you've heard 4-megahertz, 6-megahertz, 8-megahertz IBM PCs, something like that. Well, the 65816, when it runs at the same speed as the Intel processors-meaning the 8086 and the 80286 or the 80386-one of our bus cycles equals four of theirs. That means that when we talk about 6 megahertz, that's equivalent to the IBM PC running at 24 megahertz. Readers are always dazzled by the speed. Motorola talks about 12 megahertz. The Apple [Macintosh] computer has about 7 megahertz with the 68000. The equivalent speed on the 65816 would be in the neighborhood of 2 to 3 megahertz. In other words, a 2- to 3-megahertz Apple [II-series] has the same kind of performance as an 8-megahertz Macintosh. What caused you to establish the Western Design Center? I established the company in May of 1978, so we're a little more than eight years old now. I founded the company because I needed to be able to, let's say, express my 1C design concepts without restriction. I worked for Motorola. I was one of Motorola's inventors of their microprocessor system. I worked for MOS Technology before-and when they were acquired by Commodore, where we developed the 6500. And, I had a chance to contribute significantly on the 6502, obviously. I'm one of the people that invented that product. Is that also possible to speed up? Are you working on that? Yes. What we're doing on that line is, in the 2-micron technology, we're just now getting first silicon out. We're just now evaluating the first functional products. Once we have that evaluated, then we'll know some things that we can do to modify the process so that we can get higher speed. The other thing that we're doing is, we're running the same design at 11/2-micron technology, which should yield approximately a two-times performance increase. So if we're looking at a typical 4-to 6-megahertz now, we'd be looking one-chip application-specific ICs [integrated circuits] in 1976, because I was designing one. But then that was dropped. In other words, when you're working for a company like that, you should obey your management and do what they want to do. And when Commodore acquired MOS Technology they wanted to do game-type products. So, therefore, they got away from the microprocessor concepts and went to game systems. All of that meant that there wasn't too much in new ICs required, for the area of expertise that I had experience in. So I ended up saying, well, I want to do more of these things and the only way I can do more is either strike out on my own or go to a company that would want to do these things. I got the opportunity to start Western Design Center when Jack Tramiel wanted me to develop some CMOS calculator ICs. So, that's what I did. In 1978, I founded the company and we designed a calculator 1C in CMOS for Commodore. After two and a half years of working with Commodore, we parted ways. That was in 1980. In 1981, I embarked on the 65C02 development and at the same time defined the basic concepts of the 65816. And in 1982 I delivered first silicon on the 65C02, and in 1982 I also began development of the 65816. On the 65C02-did you approach Apple on that? I never talked to Apple. I never talked to any personal computer company, believe it or not, when I developed the 65C02. And I don't know why. It just was the way it happened. As it turns out, the first chip I developed was a one-chip microcomputer used in telephones today. And that has a 65C02 in it. GTE manufactures that, called the 65SC150. It has modem features and dialing features built into it. So, you see, the first actual development on the 65C02 was a one-chip microcomputer and not the 65C02 itself. I developed the 65C02 on my own budget, because I felt there was a need for such a thing. Commodore's direction did not want or need a CMOS 6502. They did not want or need a 16-bit version of it. They didn't have the motivation. They didn't have the desire, the willpower, or whatever else it takes-and I did because I was trying to survive in a little company. So basically speaking, I founded the company along my design expertise. Where I'm going right now with the company is that we're on the threshold-or we're through the door, so to speak-on a complete concept. Western Design Center is the forerunner, or at least it appears to be the forerunner, in microprocessor technology in CMOS in [terms of] applications-specific core microprocessor use and licensing. Does that include manufacturing as well as designing? We have no intention to have a factory of our own. The reason why we don't want to have a factory of our own is because we believe the number of factories that are going to exist in the future is probably limited to 10 in Japan, and probably 10-20 in the United States, and probably 10 in Europe. So, we're talking about 30-40 serious semiconductor factories in the world, and I don't know where you're going to find the money to compete against those kinds of companies. Therefore, it would be a bit foolhardy to think that I'm going to raise a half-billion dollars to get a factory and then fund it with design. I don't think that'll work. My strategy, then, is to work with these 30 factories and license them on my microprocessors, and as a result have a favorable situation where I can buy [silicon] wafers from them. And that's what I'm doing. Where did Apple Computer get your 65C02 for the Apple IIc computer? But anyhow they buy chips from me, and also my licensees. And we have many customers that do the same. Has the cost of chip development changed from your standpoint, or is it pretty much the same? Well, it's pretty much the same. I think where we see a lot of activity occurring is in the design workstations. The design workstations are trying to reduce the cost of the [chip] development. But it's been my experience that they increase the cost rather than reduce it because of the cost of the tools. You have to absorb the cost of the tools-and then what you have are people needing to be trained in the basic skills of the technology and also the skills of working with the tools. So it's really a delaying mechanism rather than a speeding-up mechanism for the first development. After you've developed a couple of ICs with the new tools, then you begin picking up speed. But sometimes that's too late. The 816 and the C02 were designed on Mylar, which is our drawing paper that we use, and we use blueprints to make copies of it. We do not use online design-like some of the big companies use-meaning that they design it on the CRT [cathode ray tube]. We don't do that, and we did not do logic capture or anything like this where we actually captured the logic on a workstation. Well, like I was saying, it slows you down. And so, we didn't have the the expense. It would cost money to do that. We didn't have the resources to buy the latest tools either. At the same time, it's very easy to draw a picture of what you want and then do it. And what you find right now is, the successful companies are still doing it the old way- they work at it. In other words, they use blueprints, they use hand-drawn things; they still use those methods. Now it's changing, but it's not going as fast as the marketing organizations of the workstation companies would like to believe. One thing I want to mention is that we are in the final stages of development on an applications-specific IC that is meant to save lives. It's going to be implanted in a human being, and it's actually a local area network to be implanted in the human body. It would serve as a monitoring system? It's a monitoring and also stimulus system, meaning that it monitors body functions and it also stimulates body functions, one of which is obvious- the heart. Other things are muscles. Other things are hearing assistance devices, and others will be sight-assistance devices. With this local area network, we can hang eight processors on it. My next microcomputer that I'm doing is 16-bit with the 816 on it and I'm hoping that gets used in synthesized vision. It will also have an implantable local area network on it. So, you can see also the range of applications. In other words, the attempt is to come out with a range of capabilities that surpasses all previous technology. You can't put a 68000 inside a human body-it's just not feasible. You can't put a 68020 in there either because it's just impossible-there's too much power. But my 65816, which can compete against the 68020, can. And it's also compatible with all the libraries for controls of such sophisticated devices from the 65C02 core. Compatibility, you see, starts paying off. What other projects are you working on that grow out of your design efforts? We're developing applications-specific ICs. And we're using, in the Apple II, low-cost personal computers to develop the ICs. I'm a visiting professor of computer science at the University of Strathclyde in Scotland, and we're looking at putting together a team where we develop the ability to do the layout graphics for ICs-the graphics editors and also the other design tools-using an Apple II as a platform. Obviously, it would be a 65816-based Apple II. Anyhow, the idea here is that we want to come out with a full set of tools using the 16-bit Apple II as the platform. And, like I mentioned, if it's still proprietary information, then we could use a board rather than use a 16-bit version of the Apple that Apple would supply. We have either way of going and it would be just as beneficial either way. Now, that means that we hope to, or plan to, develop a system that would have sufficiently accurate graphics on it- meaning resolution-that we can design ICs for under $10,000. The workstation would cost less than $10,000, and that's the hardware and software included. Now, if you go out and price the workstations right now you'll find that they're about a hundred-thousand dollars. You've got a ten-to-one cost reduction. When we're done, we're delivering what I think the world wants. In a final analysis, we're doing the same thing for the integrated circuit technology as Apple did for the computer technology. We're reducing the expense and improving the performance, meaning that the cost and performance ratios allow you to do the same thing but with a personal budget. You see, it all ties together. What does the future hold for you and for the Western Design Center? Often, I'm asked if I'm going to sell out to a bigger company. If you look at what I'm trying to do in my own way, and it could be considered small or big, it depends on what history will show. But by keeping it in an independent fashion this way, I believe that I offer more to the general society than if I was to be gobbled up by some bigger company. That kind of freedom of technology, and making and keeping it interesting for myself, I think, should just be a spark of sunshine in an otherwise sometimes dreary industry.